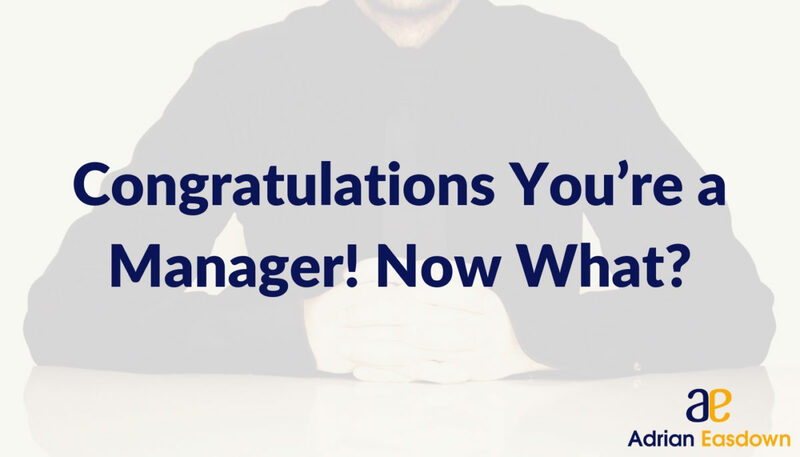 Congratulations You’re a Manager! Now What? Getting that manager role is a time when you can kick up your heels and really celebrate your achievement. Moving up the ladder in any organisation means you have put the hard work in and spent long hours making sure things work well in the business. Working on advancing your career is a job on its own, so after the celebrations wrap up you can be left with a sense of unease – what do I do now? First, you can take a deep breath. Moving to a higher-level role is still a new job, and no one knows what a job is going to be like until they start doing it. However, there are some things you can do to prepare for a management role to ensure that you are successful in your new job. It might sound like an odd thing to do, but in the first few weeks of being a manager, you should spend time doing the jobs that you will be in charge of. You may already have a good idea of these jobs if you have been promoted in the same business; however, your work colleges will go about tasks differently than you do. Understanding how they work will mean you can better help them with their day-to-day tasks effectively. If you are managing new functions, then knowing how these operate from the ground up will mean you can see where issues might occur and innovate solutions to those problems. If your new management role means you will be leading your old teammates, keep in mind that some of them could have unsuccessfully applied for the role you were given. Be gracious in your promotion, and create an opportunity to speak to other team members who missed out on the role. Facing these issues head-on can put you in a good place with the team members that were unsuccessful. It is completely normal for people to be disappointed, so allow time for them to come to terms with the situation and be a support for them during that transition. You might have some amazing ideas to innovate the process of the area you will now be managing, but don’t make changes just for the sake of making them. There is wisdom in letting your new teammates check your proposals and test a few before radically changing the way things are done. If there are processes that work, leave them as they are. If you jump right into making changes, you can end up making a mess of the area and that will reflect directly on you. Becoming a manager comes with some great perks, and it also comes with a great number of responsibilities. Understanding all the ins and outs of the area you are responsible for and utilising your team to help you deliver on these will ensure your success. Always remember that you are only as good as the team you manage, so be open to feedback and you will be successful.